Make money without making a salary? Why, that’s a capital idea! See how the super rich really make their money (and how you can, too). There are more super rich in the United States than ever before. The number of households with a net worth of $1 million or more, excluding their homes, is at a record 9.63 million, according to a new report by Spectrum Group. And, the number of households with $25 million or more also is at a new high numbering 132,000. That’s a whole lot of money! So, how do they do it? How do the super rich get that way? Being wealthy is defined as that status of an individual’s existing financial resources that support their way of living for a longer duration, even if they don’t physically work to generate a recurring income. Wealthy people build sustainable wealth that lasts for years through asset investments producing multiple streams of income. While their money is hard at work they are looking for ways to make it work harder. Wealthy people know how to make money while rich people only have money. Most rich people make a lot of money with their paychecks but the moment they stop working, they also stop making money. The wealthy have the knowledge to weather economic storms and put their money to work for them. Granted the IRS Statistics of Income division isn’t a super fun read, but if you want to get weatlthy, there’s interesting data buried in all the charts and tables. The latest report is for 2012, which is actually up to date for the government. 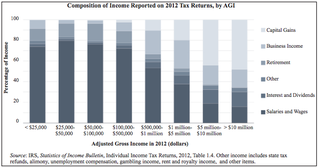 In 2012 it took $139.6 million in adjusted gross income to make the top 400. Quite a leap from the $77.4 million it took to make the list in 2009. $139.6 million only got you in, though; the average earnings were $335.7 million, up over 115 million from the $219.8 million average in 2011. Check out how the top 400 made their money. Not by working! It’s no surprise that the really rich make their money from, well, money. But the data doesn’t mean that all of the wealthy are just sitting around making millions from the stock market every year. Many of the people in that $10 million-or-more group don’t repeat their mega-earnings every year. Their income came from a one-time sale of a business or asset, leading to a capital gain. A lot of the people at the very top are there because they sold a major asset or business they’ve built for years. Among those in the top 1 percent, about half were only in the 1 percent for one year over the course of a decade. 1) Some have argued for hiking the capital gains tax from its current federal rate of 20 percent (plus 3.8 percent for top earners under the Affordable Care Act’s Net Investment Income tax). This includes President Barack Obama, who proposed raising the rate to 28 percent in his 2015 budget restoring the rate to where it was through the Bush I Administration and until 1997. The argument is that because the capital gains rate is lower than the income tax on salaries and wages, the wealthy sometimes pay lower rates than everyday earners. Remember Warren Buffet and his secretary? This looks like a ripe area to tax. 2) Capital gains are also voluntary. Owners can choose when to sell their business or asset depending on the optimal tax environment. That’s why the incomes of the wealthy can be so volatile. If capital gains were to increase, the wealthy could simply sell their assets and take the gain before the tax increase, therefore leading to lower revenue from the capital gains tax. The higher you make the tax, the more people will resist it, as history proves people respond to capital-gains tax rates. The data clearly supports the last point. A total of over 4,321 taxpayers have made the top 400 since 1992, but only 28% appear more than once, and roughly 3% appear 10 or more times. The bottom line: Becoming weatlhy––in monetary terms––is the result of investing in yourself and others, taking risks, doing a lot of small things right… and then doing one big thing really, really right. I hope, you like this article about the super rich. To stay up to date. Just like my Facebook Fanpage: The Doan’s Blog. If you want to know, how to get sustainable traffic, read this: What is SEO? My most popular blog article: International money.